As Bonnie and Lew start to work together, they soon realise that there is more to their relationship than either thought. But Bonnie is trapped in an unhappy marriage, and Lew and Charlotte have more problems than they care to admit. Each has secrets in their past which are about to be uncovered. Can they find the happiness they both deserve? One of my all time favourite books is The Teashop on the Corner by Milly Johnson, it is one of the few books I haven't dared to lend to friends in case the spine breaks or it fails to return! 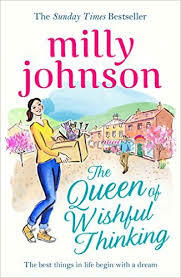 As much as I have loved Milly Johnson's other wonderful books none of them have come close to capturing my heart like The Teashop on the Corner until I read her new release The Queen of Wishful Thinking. When Bonnie is sacked from her job she wastes no time finding a new job as she walks into the Pot of Gold antiques shop owned by Lewis Harley. Bonnie and Lewis have a real eye and passion for antiques and together they could make a real success of The Pot of Gold, it soon becomes their haven to escape from their own marriages which are anything but a success. We return to Spring Hill Square where The Pot of Gold sits next to The Teashop on the Corner and just like in that book the community spirit is still plentiful in this book and the friendliness and warmth of the supporting characters is something I love. Troubled relationships for both Bonnie and Lew feature heavily in this book and especially from Bonnie's marriage there were alarm bells ringing and all I hoped for was for her to find her inner strength and take the support from her friends to make the move to put herself first. Although her story casts a dark shade across the book the joy and light is balanced out with the comings and going in the shop to give a great balance to the storyline. Bonnie and Lew were both such strong and lovable characters who I wasn't ready to leave behind at the end of this book so I really hope Milly Johnson feels the same and will revisit them in anther of her books in the future. Fans of Milly Johnson will adore this book and any new readers will find themselves immersed in this authors wonderful storytelling. Can't wait to read this... fab review!